I’m reading “The Village Carpenter” by Walter Rose. I bought this on the recommendation of a blog I was reading (which I don’t seem to be able to find just now but it has certainly been on Sean Hellman’s and Peter Folansbee’s). This was written in the 1930s by Mr Rose who was born in 1871, so his grandfather’s business went back to very traditional times. I’ve just read the chapter on making and repairing wooden pumps cut from green elm on the farm where they are to be used. Excellent! You can still buy the book, it is a real classic and immensely enjoyable. The modern print is paperback, I managed to get a secondhand hardback copy (with a 1947 inscription inside). This was about Keighley between the World Wars. Ian is an old time raconteur who used to work in the reference library in Keighley, well I say worked there – he was more of an institution and dedicated to recording local history. There were many gems in his talk, but the one I’d like to share is about a lady who brought a spoon to the library for the archives. Ian had an open invitation for people to bring him historical material. It turned out the wooden spoon was her father’s issued to him when he was posted to Russia after the First World War fighting with the White Army, because metal spoons would have been impractical. The punch line of the story was that she had also had all his letters home from Russia – but they had burnt them all! SHe didn’t think they were important because he was only a lance corporal. This entry was posted in Book review, hand made by Flying Shavings. Bookmark the permalink. Thanks for the recommending the book. I’ve added it to my wish list on amazon. Hopefully my wife will take note for Christmas. Thanks for the reminder, Richard. I like his axiom about post ramming! The Village Carpenter is an excellent read. I’ve read my copy twice already and I enjoyed both readings. Walter also wrote another book about all the over people of the village called Good Neighbours. This book dovetails rather nicely with the first book. Worth reading if you get the chance. From a woodworker’s perspective, the technical details are a little scanty. Sturt repeatedly says he doesn’t want to go into dull technicalities, but I suspect there are areas he doesn’t (actually) know about; Sturt was never a wheelwright. He owned and ran a wheelwrights shop. Still, as an observer and sometime “boy” (unskilled assistant) he did pick up enough to be of use to the men. He was also strongly influenced by Ruskin (and presumably William Morris). Sadly, we later find out that he was not a good enough socialist to convert his men (they worked in a leisurely fashion), and not a good enough capitalist either (his attempt at forming a cartel led to losing customers when it was publicised by a potential cartel member!). There is far too much of Sturt’s semi digested philosophy, and not enough simple narrative to make this a great book, although there is good stuff in there, in places. 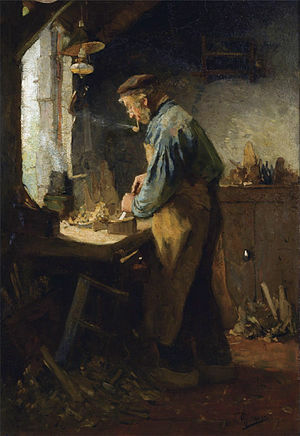 The book this should have been, happily exists; it’s “The Village Carpenter” by Walter Rose. Ha! Then it wasn’t me – I prefer Sturt’s book to Rose’s…I always recommend it. Neither will tell you how to perform the trade(s), but that was not their scope. I must have read one of the blog posts you did, because I had never heard of Rose’s other book & I just read it this summer. I guess the real deal is to read ’em all. No harm in it. 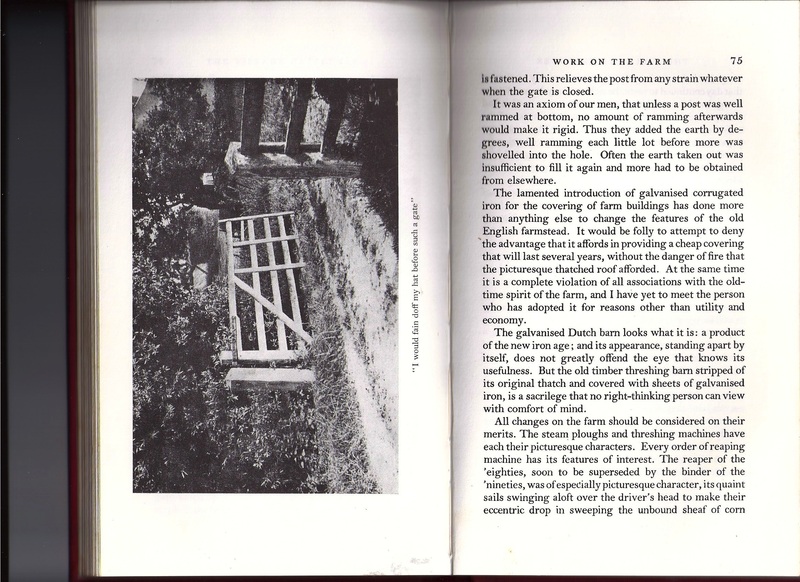 I have a copy of both “The Village Carpenter” and “The Wheelwright’s Shop” and read them regularly. My great grandfather was an Essex trained wheelwright, my grandfather a Tasmanian trained carpenter, so there is a family interest if you like. I suggets there is rather more detail on methods and techniques in The Wheelwright’s Shop than in The Village Carpenter, and a fair dash of social history and longing for the days that will not come again in both. The site of the Sturt family workshop in Farnham is now a Jaguar car showroom, for whatever that may be worth. I wonder if George would appreciate the irony. What a coincidence, I’ve just bought The Wheelwright’s Shop! Watch this space.